It's SUMMER TIME! Many of our Mortgage clients are asking us about financing pools. There are a few different options for this. For those of you buying a new home and leveraging a conventional loan, Efinity Mortgage offers the Fannie Mae Homestyle program. This allows our clients to finance the cost of improvements (pools included) into the home loan. The original appraisal is completed subject to the improvements being completed. Additional downpayments may be required depending on the final valuation. If you are an existing homeowner and looking to add a pool to your home, there are a number of different home equity and specific pool financing options for you. As for the type of pools, many people are not aware there are several different types available. Natural pools are chemical-free, low-tech and affordable alternatives to conventional models. You can build a natural pool with gravel and clay instead of concrete and fiberglass. Aquatic plants keep the water clean instead of chlorine or a filtering system. Plants are also a natural purification system that introduces oxygen and good bacteria into the water. You can also include additional elements like green pool roofs and vertical gardens to increase the health of your pool. Moss-filtered pools cut down on the need for chemicals like chlorine. Having moss in your pool also reduces water use and decreases how often you need to backwash the pool for cleaning. According to statistics from the University of Maryland, moss systems reduce chemical usage by 40 percent, water consumption by 75 percent, and save about $6,700 annually in bills. Like the ocean, saltwater pools use a saline composition to keep water clean without chemicals. Saltwater pools use a mixture of chlorine and table salt to create electrolysis, which gets rid of algae and bacteria. 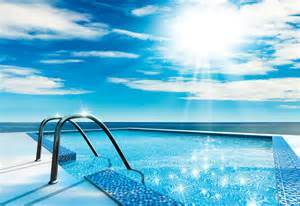 If you want a mild saline pool, clean your chlorine cell once a year to prevent calcium buildup and add salt to the water once a month. Reducing chlorine usage helps to minimize overall chemical consumption. Installing an ozone sterilization system is another enviro-friendly method of cleaning your pool. An ozone system uses electricity to convert oxygen into bacteria-destroying ozone. These systems can reduce the need for chemicals by at least 80 percent, if not altogether. This will save on your pool maintenance costs and help keep the environment clean. Efficient condensing boilers can help to cut down your pool heating costs by almost 20 percent. You can use alternative heating methods like solar blankets and energy-efficient heat pumps to keep your pool warm. Enviro-friendly heating methods can lower your bills and reduce carbon dioxide emissions. Efficient heating isn’t a type of pool, but it’s a simple way to help your pool remain friendly to the environment and your wallet. We hope you find this information helpful and feel free to reach out to us with any questions you might have. This week was pretty unusual for the Efinity Mortgage staff. Seemingly out of nowhere we had several new clients come in requesting financing for investment (rental) properties. As if there was a sign on our door which read "Efinity Mortgage; The Rental King". It's not that we don't finance investment properties but to have several new transactions in a week is highly unusual as the majority (99%) of our business comes from realtors and builders seeking to assist a family in buying a primary residence. All of that said, I do want to share a story of one couple in particular who were kind enough to give me the ok to share their story. The "Smiths" were existing homeowners and in the process of adding to their family of 5. Mrs. Smith was interested in leaving the workforce and to manage their properties. Noble concept especially since Mrs. Smith was a $200,000 wage earner! You see whether you’re going away on an extended vacation or considering downsizing into a smaller place, the popularity of websites like Airbnb has led many people to believe that there’s a lot of money in home rental. However, before putting your home on the market, it’s important to be aware of some of the factors that go into having a rental property. It may seem like extra money, but it’s the small details that can make it a more complicated process. Many people plan on putting their home on the market for a short duration of time, but if you’re only planning on renting for 6 months or a year, it may not be as financially lucrative as you think. While tax breaks can go along with rental properties, the money you make off of this kind of investment is taxable so if you’re not in it for a slightly longer haul, you may not see the financial boost you’re looking for. What Are You Willing To Deal With? For those who are planning to put a home on the market, they still need some place to live, and this can mean that a certain amount needs to be made each month for the costs of having two homes even out. Before putting any serious considerations into this, ensure that you know it’s financially feasible. It’s entirely possible that you won’t have renters for certain periods of time and you could also run into problems with the renters you find, so you should sit down and put pen to paper to consider the investment potential. Have You Considered The Maintenance? Out of sight is often out of mind, but if you have a renter, you’re responsible for anything that goes wrong in the home. From small maintenance duties to sizeable but necessary overhauls, there are many things you’re legally obligated to do as a landlord and you’ll need to be prepared to take on these responsibilities. Since it will be the duty of the owner, in the event you don’t want to do it, you’ll have to hire a contractor who will be able to handle the work for you. Having a house as a second property may seem like an ideal investment, but this can require you to take on the responsibilities of a landlord and you may even have to deal with problematic rental situations. If you’re searching for an additional property in the near future, contact us for more information. Everyone has different plans and goals and deserve to properly vetted.